Q: You must be in good spirits following your podium in Shanghai? KR: It was a pretty okay weekend, but it wasn’t the win and it’s still early in the season so we’re not celebrating too much yet. Q: What are your thoughts on the next race in Bahrain? KR: Obviously, it was a good race for us as a team last year. It was my first podium for Enstone, and we had a good fight all the way. We took a gamble during qualifying, and it didn’t work out well for us. This meant we missed out on the top ten, but we managed to use our tyres pretty well in the race and we ended up fighting for the top step of the podium, which is always a good thing. Q: You fought for the win with Sebastian Vettel last year; with the benefit of retrospect, was there anything different you could have done to get past him? KR: I could have tried to overtake him on the other side! I only had one shot and I picked the wrong side. After that I was unable to fight back and second was still a pretty good result, but it’s always better to finish on the top step of the podium. Q: How do you rate the Sakir circuit? KR: I like it. I’ve had some nice races there and picked up some good points although I’ve never won. It’s a little bit different from others we visit and it’s quite nice to be out there in the sand! Wherever you look around the track you can just see sand in the distance and you notice it in the paddock too. It’s a circuit where I’ve never won before, so maybe this year I’ll change that. Q: How difficult is it to get the car as you want it in Bahrain? KR: It is not easy to find a good set-up as you do experience the track surface changing over the weekend and sometimes the wind can affect the balance of the car too. It’s one of the more tricky places to get the car exactly right, but at least you don’t often have to worry about rain! Q: Is there potential for another good result? KR: Apart from Malaysia we’ve had good races this year, but that said there have only been three races so it’s too early to say anything. Just because we had a good result there last year, it doesn’t mean Bahrain will be good for us again this year. We have to try and do the best we can in every race and try to score some points to keep us in the fight. If everything goes our way, it will be a good result again. However, it is useless to promise anything beforehand. This is motor racing and whatever can happen, will happen. Q: How was it to get second place in China? KR: Second wasn’t quite what we wanted, but in the circumstances it was the best that we could manage. I wasn’t 100% happy because we didn’t win, but it is what it is and second place was a good result after a bad start and the incident with Sergio [Perez]. Q: Do you think you will start modifying the bodywork of your car in the future? KR: It’s unfortunate when a slower car gets in your way like that and you never know if it could happen again. Obviously the car is not designed like that otherwise we would use it all the time, but I was surprised how good it was still. Obviously we had some trouble with understeer and some other handling issues, but we had to try to live with that and the pace was still pretty okay. 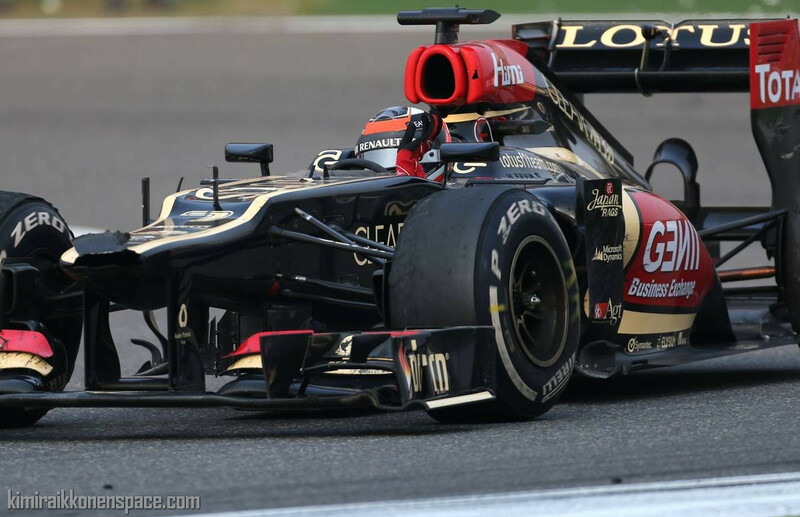 Q: Tyres seem to be quite a talking point again; what does Kimi Räikkönen think? KR: I think you can push on these tyres, but it’s never perfect. You cannot always push 100%. I think they are very good in qualifying and have good grip, so it’s up to you and you have to look after them a bit more in the race. It’s not really any different from last year – at least for us anyway – so I don’t really understand why people are complaining. Team principal Eric Boullier defended Grosjean’s start to the season, citing comparisons with the ‘gifted’ Kimi Raikkonen. “Romain faces the very tough challenge of driving the same car as one of the most gifted driver around in Kimi; a driver with tremendous experience who returned to the sport last year and was very good straight away,” he said. I have a problem with what Eric is saying with regards to Romain. Eric said this year he wants the team to cement its position as a top team, and with Kimi thats for sure a step in the right direction. But P3 for constructors is probably the best they can hope for and not because of a team effort but because Kimi is doing all the work. If Mercedes can get both cars to the end consistently you can kiss P3 for constructors goodbye. While the praise for Kimi is deserved for sure, it would be comforting having that back up to take points off those competitors when they have difficult races, right now even a toro rosso can be faster than a fully equipped E-21, totally unacceptable. Well, you are absolutely right. Malaysia was actually complete mess for the team. Grosjean was in front of Kimi, but only one place in front. He hasn’t scrathced even a point from others like Rosberg, Hamilton at least. It would have been better just to lift the throttle and let Kimi get those 2 points. Massa at least got 2 points from Kimi in Malaysia. Kimi never really cared about other side of pit garage, but he is not having the comfort in terms of his team mate stealing points from major opponents. Bahrain was good last year for Grosjean. Maybe he can at least follow Kimi and get 4th place. As for Kimi, I expect another strong performance and P2 or probably win!